The House History Man: History of Formstone & Permastone: Love It or Hate It. History of Formstone & Permastone: Love It or Hate It. Formstone. Perma-Stone. Rostone. By whatever trade name, the mere mention of simulated masonry can cause a wide range of reactions—from the rolling eyes of homeowners who want desperately to be rid of it, to passionate defense by preservationists of 20th-century building materials. Patented by Baltimorean Albert Knight in 1937 for his Lasting Products Company, its use was so widespread that in 1997 Waters made it the subject of a 30-minute documentary film LittleCastles: A Formstone Phenomenon, told by the people who made it, sold it, bought it, and installed it. Coproducer Lillian Bowers (with Skizz Cyzyk) says she got the idea for the documentary when she dreamed that her father’s gravestone was being covered with Formstone. Other brands included Rostone, Tru-Stone, Fieldstone, Bermuda Stone, Modern Stone, Romanstone, Magnolia Stone, Dixie Stone, and Silverstone. It was applied in a manner similar to stucco, usually in multiple layers, to wire net or lath attached to existing exterior walls, then scored with simulated mortar joints to suggest individual stones. Adding to the illusion were often artful coloration and sometimes mica chips that would sparkle on a sunny day. Perma-Stone was registered as a trademark in 1929 by a Columbus, Ohio, company of the same name, which trained and authorized local dealers and provided them with the molds and materials they needed to install it. Its immediate success spurred competitors to fill the desire for a maintenance-free covering for poorly constructed exterior walls. The Wieboldt-Rostone House was a steel-frame structure clad in Rostone’s prefabricated panels of shale and lime. Later relocated to serve as a residence in Beverly Shores, Illinois, the house served more than anything to demonstrate just how wrong they were. The original Rostone failed and was covered in the 1950s with Perma-Stone, which has also now fallen apart. The original use of Formstone, patented in 1937, was to apply a uniform exterior covering to suburban houses that had undergone additions with unmatched siding. 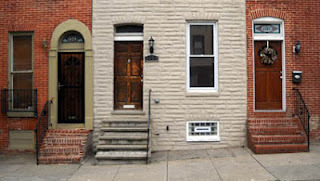 However, it quickly became more popular for covering the exteriors of old row houses in Baltimore, built by the tens of thousands using porous brick that left them plagued by penetrating moisture. Formstone salesmen touted sealing qualities and a 20-year guaranty that, for the cost of three paint jobs, would virtually assure a lifetime free of leaking walls and peeling paint. At that point, though, faux stone was reaching its zenith, about to be overtaken by much cheaper aluminum and vinyl siding. Two types of simulated stone were available to homeowners, whether for remodeling or new-home construction: siding manufactured off-site in molds and applied somewhat like real stone and cement-based materials applied in layers on-site. Perma-Stone and Formstone, among others, were created on the job site, much like interior plaster. Normally the first step was to nail up a lath to anchor the initial 1/4″ to 3/4″ rough, or brown, coat. The lath was usually metal but sometimes wood; chicken wire was commonly used with Formstone. Some products were sold as not needing lath, so workers applied the cement-like mix directly to the exterior walls—a cause of great pain to anyone trying to remove it decades later. When the brown coat was dry, the installers applied a second coat of equal thickness and, while it was still wet, some artistry could come into play. Like ambitious children building a sand castle, craftsmen could press the surface with molds, score it, or run an aluminum roller across it to create a crinkled surface. Faux mortar lines could be left or filled. A finish coat then provided subtle coloration; a final membrane coating helped waterproof the layers. This on-site installation, plus the variation in skill levels and personal flourishes from contractors or homeowners, explains the wide variation often seen among even adjacent buildings. If you’re considering removal of Formstone, of greater interest is what you don’t see. The installer could apply the coatings anywhere that chicken wire could be nailed—around curves, up and over cornices, over sills and decorative brickwork. Thus the structure could be given large faux keystones, quoins, or other decorative touches—sometimes far off-center or out of scale. Worse, original architectural features were often entirely removed—chiseled off and not merely covered up. 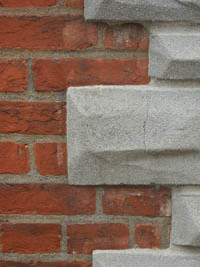 Mortar around damaged brick may be mismatched or the bricks filled in with an entirely different material. 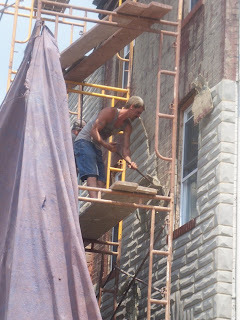 Workers removing Formstone on an upper storey in Fell’s Point found a layer of cement up to 6″ thick that had been used to level out a brick wall that had bowed in. When homeowners were “modernizing,” they often installed new windows and doors—no matter that they were smaller. 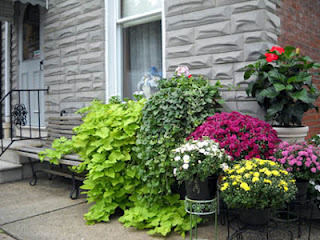 The surrounding areas were just filled in with nonmatching brick or cinder block before being covered with Formstone. Lost architectural features weren’t just decorative. Cornices, belt courses, lintels, and sills that once did their job to divert water away from exterior surfaces were chipped away. 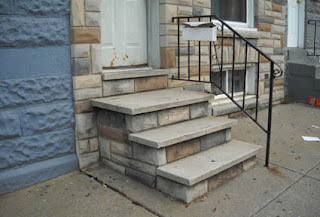 Add to this the deterioration of the Formstone itself—which after time can crack or pull away from the wall—and a pocket is created where water can seep undetected behind the faux masonry, leading to destructive freeze-thaw cycles. This is especially troublesome on wood-frame structures where the decorative cornice was removed, causing water damage around ceilings and windows. In short, damage is inherent to the surface underlying simulated masonry. The question is how much? 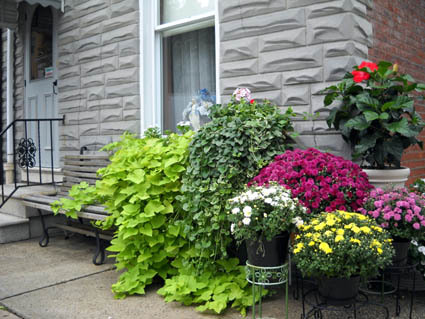 Problems arise, he says, when people anxious to be rid of the stuff begin ripping, hammering, and chiseling—especially if theirs is faux stone applied directly to the underlying siding. Ripping down Formstone can be a fast and inexpensive process—it can be taken off a two- or three-storey row house in a weekend—but restoration of what lies beneath can take weeks, in the case of wood surfaces that need nail holes filled and a new paint job, to months for masonry surfaces that have been severely defaced. Once you have assured yourself of a sufficient amount of matching brick or other material to replace damaged areas, you may want to tackle the removal of Formstone yourself. The only tools that are needed are a pry bar or two, hammer, wire cutters, cold chisel, hard hat, goggles, and heavy work gloves. You’d be wise, though, to commit to scaffolding rather than a ladder, since cement layers up to 1 1/2″ thick can be humongously heavy. Work from the top down, since loosened sections will fall off the face of the building. For that reason you should also think about protecting windows with plywood. Rope off the area to keep away children, pets, and sidewalk superintendents. Starting at a window edge or door frame, chisel away enough faux stone to let you wedge a crowbar behind it. Once you get started, you should be able to hammer in your crowbar and remove the stone and lath in fairly large sheets. Don’t try to peel away bigger sections than you can handle, and use a narrow piece of plywood under your crowbar to avoid chipping into the brick or wood. 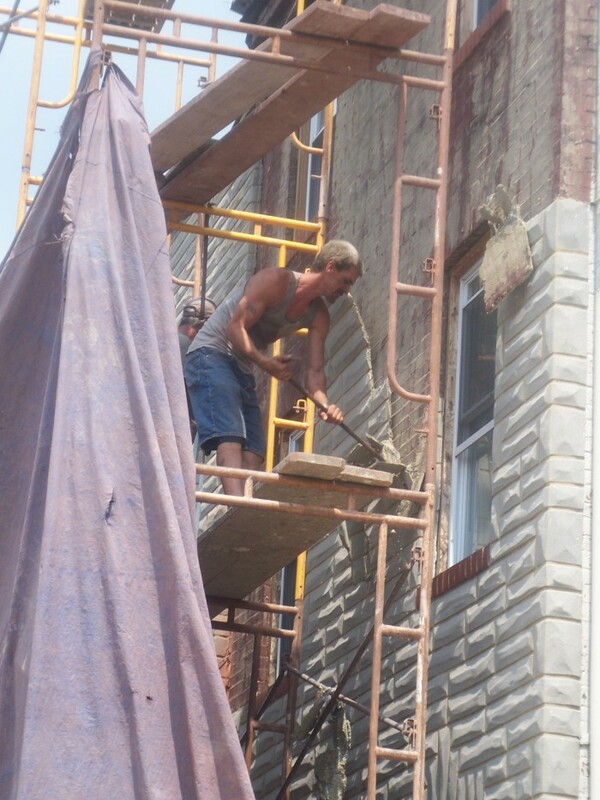 On brick surfaces focus on nail points in the lath, usually placed in the mortar joints. In most cases the weight of the simulated masonry will break the lath or chicken wire; if not, you may need the wire cutters. Once the Formstone is off, and you are spared nightmarish surprises like shrunken windows and doors, the procedure is like a typical façade repair. If the Formstone was applied with nails, you can anticipate replacing face bricks, especially around windows and doors. Even if the installers were careful to put nails into the joints, you may find that removal has broken them off or pulled them out, and you’ll have to rake out the joints and repoint. You’ll probably want to strip and clean previously painted brick—or you may find that you need to paint it to mask damaged and nonmatching masonry. And many real estate agents, as they did more than a half century ago, readily advertise a faux stone exterior as value-added feature. The debate is likely to become even more heated as 20th-century building materials leave their mark—in this case often all too literally—on American architecture. I have an old house with permastone exterior and tin roof with no gutters. There is a black substance on the walls near the ground with a pink color rising up the walls. How do i clean this? Removal of the permastone is not an option. Either way stay up the excellent quality writing, it is uncommon to see a nice weblog like this one these days..